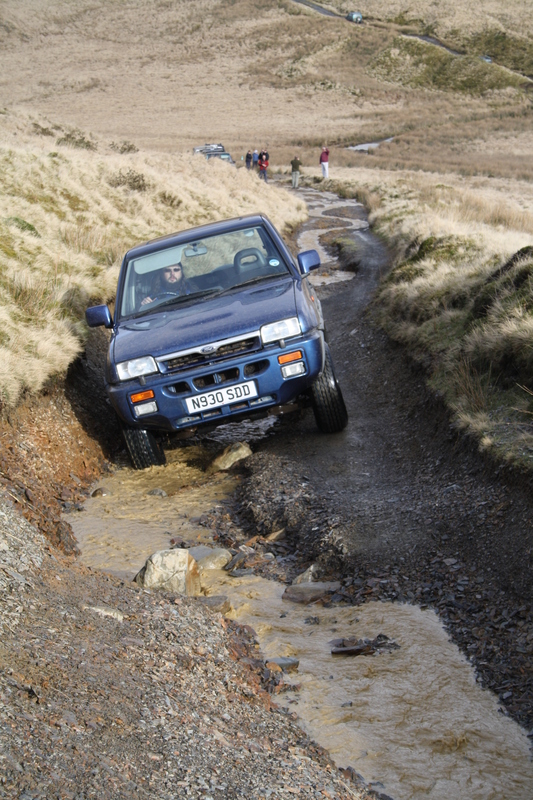 Project Budget 4×4: In the rough stuff – HubNut – celebrating the average! I’ve spent many days this week writing a Blog all about our new lives, with an in-depth look into our escape from the rat race, changes in personal outlook and what it’s like to live with sod all income. Turns out I’m rubbish at it, but happily my wife isn’t so if you haven’t already, head to Growing Things and Making Things. I may revisit my feeble attempts at telling our life story at some other point, but for now, it’s back to the cars. Like an excited child awaiting Christmas, for some reason I was very, very excited about heading out to tackle the Byways of Nant-y-Moch in my budget 4×4. I was joining a trip organised by West Wales Laning, who quickly became essential buddies when I decided that I rather liked getting off the asphalt track. My group was led by a chap in a Land Rover Discovery – they’re very popular as they’re cheap and very capable – with me second and a Range Rover L322 bravely following, as well as a Land Rover Defender. This is what it's all about. Off-the-tarmac fun! I guess some of the excitement was sheer anxiety. I’d done my research, but would the Maverick actually be any good in off-road conditions? Not that it is technically off-road. These are public highways which just don’t have a surface. Ramblers please take note. We are good 4x4ers who stick to the routes we should do. We don’t just go tearing off where we like – though sadly some must always spoil it by doing whatever they want. I quickly learnt that the Maverick really is very capable in the mucky stuff. The only real downside was a ride which was rather unyielding. By the end of the day, I’d had enough of being bounced around. I’m sure the Range Rover was easier on the spine. The Maverick coped with driving on three wheels at times, displayed impressive axle articulation, refused to conk out when subjected to bonnet-high waves of water and clambered over all obstacles, often with ease. This is immensely pleasing. I wanted to prove that buying at the bottom of the market needn’t mean a compromise when it comes to green lane fun. Perhaps I have. After all, while the L322 Range Rover was mightily impressive, I bought my Maverick for the cost of a pair of second-hand Xenon headlamps for the Solihull luxury machine. It’s all clever stuff, and very effective, but buying cheap and keeping it simple worked just as well. And the Maverick really is simple. The basic 4-wheel drive system – rear-wheel drive for most conditions, with selectable four-wheel drive via a high-low ratio transfer box – is similar to that used on Land Rovers for decades. Yes, the limited slip differential at the rear is quite fancy, but it compensates for less suspension travel than a Land Rover possesses. There is no centre differential, no traction control and certainly no Hill Descent Control. That the Maverick is good off road really shouldn’t be a surprise. While Toyota’s Land Cruiser gets all the plaudits for toppling the once-mighty Land Rover, the oft-forgotten partner in crime was the Nissan Patrol – a car many Australians rate ahead of the Toyota. The Maverick is a Nissan in all but badge and the Blue Oval had very little to do with the design. As part of the first wave of ‘soft’ roaders, the Maverick actually isn’t very soft at all. Few compromises have been made on the off-road ability, even though the on-road performance is surprisingly strong. The project looks to have been a success then. So far, the only fly in the ointment (other than brake issues…) is a slightly disappointing 22mpg. I look forward to seeing if I can top that figure, as in its off-road ability and in its everyday-practicality and ease-of-use, the Maverick has become a car I really quite like.